Total: 299-cases, 71 known fatalities and a current CFR of 23.7%. Since mid-January the province of Zhejiang has moved into triple figures for H7N9 cases. At around the same time the provincial capital, Hangzhou became the first city to reach more than 50-cases, surpassing Shanghai as the most impacted city by H7N9. Given those unfortunate statistics I thought it might be worthwhile to crunch some data on Hangzhou, Zhejiang. 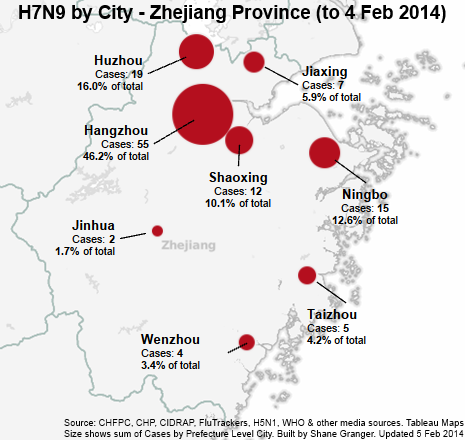 Firstly, let us look at the 119 Zhejiang H7N9 onsets by prefecture level city. Six of the latest cases are from Guangdong province, continuing a strong second-wave tilt toward the mainland’s southernmost areas. In the first wave, locations north of that area were driving most of the outbreak activity: Shanghai, Jiangsu province, and Zhejiang province. Zhejiang has experienced 73-cases in the second wave which is much higher than Fujian (13) and Guangdong (49) below it. Of the 73-cases, Hangzhou alone had 23. On the second point the infographic also (interestingly) highlights that 90.8% of Zhejiang’s cases are concentrated in the north of the province, emphasising a north/south provincial divide. I can’t suggest a reason for that outside of population density. Next, let’s look at cases by month of onset with an emphasis on Hangzhou. During April 2013 (the bulk of first wave cases) there was a significant spike in numbers from Hangzhou (28.9%) as compared to Shanghai for the same month (18-onsets at 18.6%). As you can see from the provisional data for Hangzhou in January the case load is less both in terms of numbers (25) and as a percentile of total cases (18%), although the overall numbers are greater. Lastly, a look at the second wave case load within Hangzhou. Here is the biggest surprise (IMO). Although farmers make up 10 of the 23 second wave cases in Hangzhou all of the cases (minus one in Fuyang City and three which are unconfirmed) are not in the outlying cities and districts of Hangzhou but in the more tightly congested metropolitan areas of the prefecture level city. 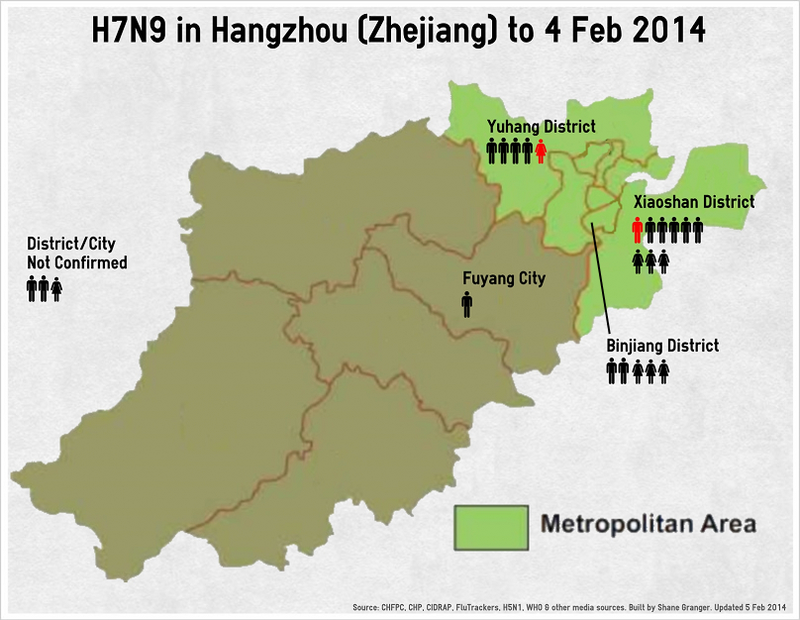 It seems the Chinese peri-urban divide is a significant risk factor in catching H7N9, at least in Hangzhou. H7N9 has almost been around a year and as we verge on the 300th case I think we have spent more than enough time doing provincial level analytics when we now can and should be spending a little more time getting granular with our analysis.